We’ve now reached the second half of my top 10 favorite Spider-Man battles of all-time. The first half of this list consists primarily of Silver and Bronze Age altercations that are right in Longbox Graveyard’s wheelhouse. Well, the second of these lists will definitely contain some old-time classics. But, I’m also about to push some of you out of your comfort zone and introduce some scenes from comics that – gasp – occurred over the last 20 years during the much reviled “Copper” or “Chromium” Age. When Roger Stern introduced Hobgoblin to the world in the mid-80s, the character could have easily devolved into just another cheap Green Goblin rip-off capitalizing on all the heat between Spidey and the Osborn family. 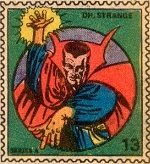 Instead, Stern crafted a villain that was as intellectual as he was mad. The three issue arc starts off with Hobgoblin having obtained scores of confidential information about some of New York City’s most elite residents and businessmen. His objective is to blackmail these people for financial gain. Of course Spider-Man gets involved, but during the course of these issues, his Spider-Sense is no longer working (that seems to be a common device in Marvel deck stacking strategy for Spidey). The altercation culminates with Spider-Man attacking Hobgoblin aboard his “Goblin Van.” What follows next is the comic book equivalent of some of the better car chases scenes you’ve ever seen in the movies. The Goblin Van is set to auto-pilot as Hobgoblin and Spidey throw haymakers at each other, including one well-placed punch that reactivates the hero’s Spider Sense. From there, the van crashes into the Hudson River and thanks to the power of self-destruct mode, explodes. 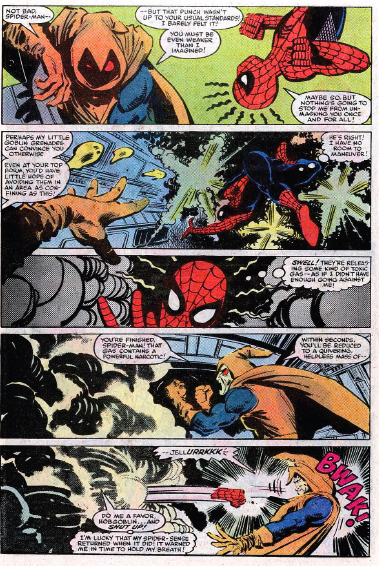 Spider-Man moves far enough away from the explosion but finds Hobgoblin’s mask. These issues mark probably the last great Hobgoblin story for Amazing Spider-Man (Stern would later leave the title before the mystery of his identity was resolved). I’ve also long appreciated the indulgence of the Goblin Van sequence. Artistry and nuance is great and all, but sometimes I just want to see stuff blow up. Probably more famous for marking the death of Gwen Stacy and the end of the Silver Age, these issues are significant from a conflict resolution standpoint as well. Namely, throughout the duration of his existence Spider-Man/Peter Parker had vowed never to kill an adversary and these issues show Peter moving as close as he ever really gets to delivering a fatal blow to an opponent in the Green Goblin. 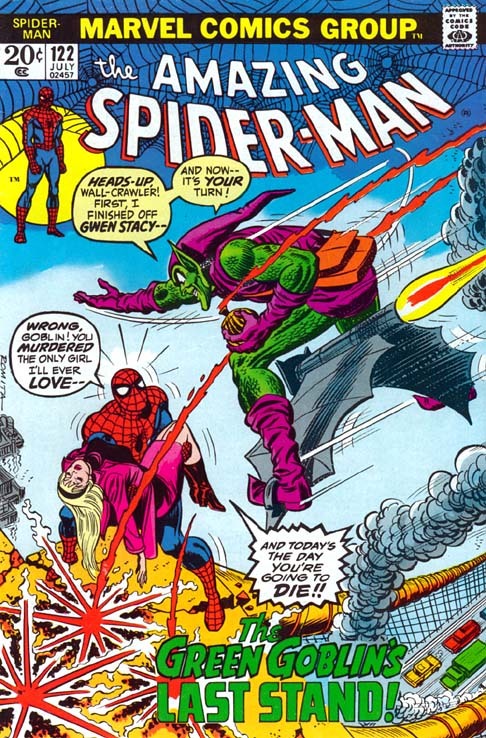 And even though Peter still doesn’t betray his moral code of power and responsibility, writer Gerry Conway and artist Gil Kane have the sense to at least give the audience some satisfaction, by having Norman Osborn inadvertently kill himself when he summons his glider past a leaping Spider-Man right through the center of his torso. These two issues are filled with sadness and mourning for the death of Gwen Stacy and the personal battle Spider-Man was left to fight against the Green Goblin. The reader is also left questioning Spidey’s failures in rescuing Gwen – did his webbing inadvertently snap her neck after she was thrown from the bridge (most people believe so)? It’s probably the one time in Spider-Man’s history where I would have gladly looked the other way if he decided to beat Norman Osborn to death, and yet the fact that he doesn’t, makes the character all the more noble and heroic. My affinity for this storyline has always seemed to cause controversy when I speak about it on Chasing Amazing. It’s not because people don’t think it’s great – but I’m guessing the fact that it was only written in 2001 makes it difficult for some to rank it among the all-time best. For me, this is the pinnacle of J. Michael Straczynski’s run on Amazing Spider-Man (for what it’s worth, it was also his very first arc). The storyline introduces a new spin on Spidey’s character – that perhaps his animalistic powers were inherent and the radioactive spider bite just brought him the awareness needed to use them. It also introduces Morlun, a supernatural ghoul who feeds off the energy of super-powered folk like Spider-Man. Spidey’s confrontation with Morlun is yet another instance of the creative team throwing as many obstacles as they can think of to stack the odds against Spider-Man. Morlun is faster, stronger and more persistent. And because he’s a brand-new character with plenty of motivation to “feed,” it makes readers wonder if this will finally be the time where Spider-Man doesn’t survive. Spidey himself even questions this, when he makes a depressing call to Aunt May saying he loved her before marching off to meet his uncertain fate in battle. 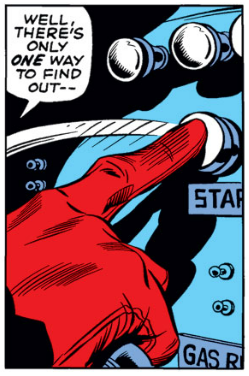 Never have I remembered Spider-Man being so resigned to defeat, but looking straight ahead anyway. And it’s ultimately Peter’s resignation that helps him to succeed. By allowing Morlun to “feed” on him, the villain discovers that Spider-Man is in fact, not pure, and tainted with radioactive blood. 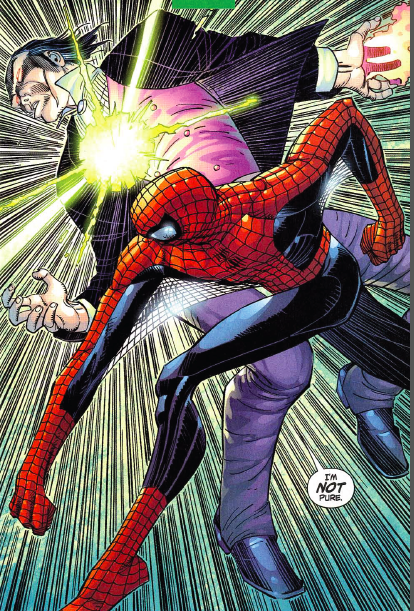 The radioactivity weakens Morlun enough that Spider-Man finally has his opening to physically subdue his opponent. I don’t think there was ever a superhero whose impurity was celebrated the way Spider-Man’s was in this storyline. Probably Roger Stern’s most famous story-arc, the Juggernaut’s crossover into the world of Amazing Spider-Man celebrates everything we love about the Web Slinger. 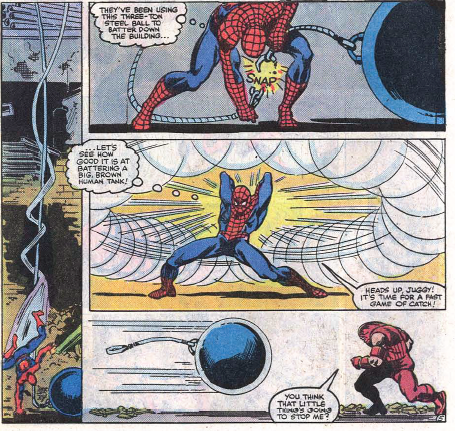 Juggernaut shows up on Spidey’s turf and nearly kills the hero’s friend, Madame Web. From there, every panel is filled with non-stop action and tension as Spider-Man throws every trick in the book to try and subdue his opponent. Juggernaut meanwhile keeps brushing Spidey aside as if he were an annoying little gnat. What makes this confrontation so exceptional and head and shoulders above every other one on this list is that Juggernaut ends up being an absolutely perfect foil for Spider-Man. By definition, “nothing can stop the Juggernaut.” And yet Spider-Man is best known for his uncompromising, never-say-die spirit. So when these two collide, it’s the unstoppable force versus the unbreakable spirit. Of course, because this is a Spider-Man comic, spirit ultimately succeeds over force, but it takes Peter’s intellect, along with some well-placed wet cement to finally stop the Juggernaut in his tracks. There’s a reason why this is consistently ranked one of the greatest Spider-Man storylines of all-time. Because even after reading it dozens of times, it still gets me up and out of my chair and cheering each and every time I give it a look. Posted on April 10, 2013, in Lists! and tagged Amazing Spider-Man, Green Goblin, Hobgoblin, Juggernaut, Morlun, Spider-Man, Top 10, Venom. Bookmark the permalink. 45 Comments. I’m diggin’ this Top 10 List. Love the inclusions of ASM Annuals #1 and #5. And, I agree with the choice for the number one greatest Spidey battle. Way to break it on down! Yeah, I got over my own fear of annuals to come up with those battles. It was a tad unsettling to have a non-Spidey foe beat the #1 battle, but from a Spider-Man perspective, what’s honestly better than that Juggernaut fight? Amazing Spider-Man Annual #1 is a wonder of the world. Thinking I should hunt down a copy to stand in for the complete lack of Silver Age Spidey (any age of Spidey, really) in my collection. Definitely didn’t see Spidey vs Juggernaut coming. Nice list, great analysis! It’s a great superhero comic book story, give it a read if you haven’t already. I would have done a “greatest single issues post” about it by now, but it isn’t … uh … a single issue. Great list. All the Roger Stern-scripted Hobgoblin fights were great. 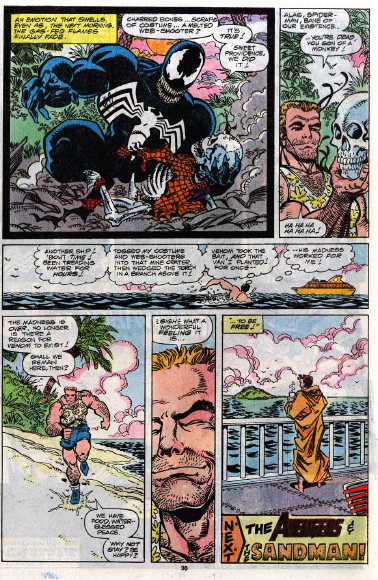 And I loved that Venom fight on the island too, but they should’ve left him there (at least for a few years). Uhh… the Kraven burying the web head in Spectacular Spiderman – Amazing Spiderman cross over epic. That storyline beats all the others you listed jambroni. The Kraven is unstoppable. He kills the stupid puny spider. And Carnage!!!! A real serial killer. 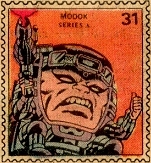 None of this bozo gerk squad Green Goblin bs. Carnage is for real. He even spooks Venom.